It’s become a tradition in recent years: to coincide with Apple’s September music event, where new iPods and related hardware are presented, iTunes increases its version number by a notch. This year’s vintage features one major new feature, a handful of interface changes, and some minor tweaks. Here’s an overview of what’s new and different in iTunes 10. The flagship feature in iTunes 10 is Ping, Apple’s new “music-oriented social network,” which lets you follow friends and artists, and share your musical tastes. Naturally, this is tightly linked with the iTunes Store, so any music you like shows up with links for your friends to buy that music immediately. Users of Facebook or other social networks will grasp this pretty quickly, and, while there aren’t many artists on it at launch time, it’s clear that many bands and singers will use this to try and drive sales. To access Ping, click the Ping link in the iTunes sidebar, below the iTunes Store, or click the Ping button in the toolbar when in the iTunes Store. Most of what you need to do is self-explanatory, but we’ll take an in-depth look at Ping soon. The new iTunes sidebar is a bit dreary. 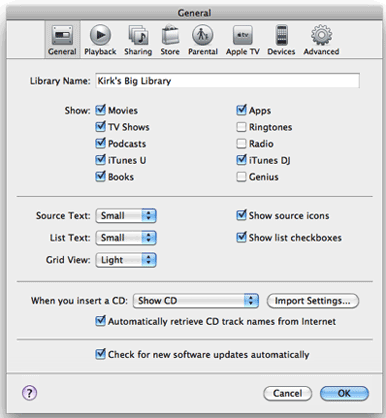 iTunes 10 features a number of interface changes, and many of them seem designed to save space. Since it’s hard to display all the information about music and other media in iTunes, a few pixels here and there gives users more room in the different views available. In the somber blue-gray sidebar (it was blue before), whose multi-colored icons have become an unfortunate uniform gray (though the new playlist icons are an improvement), there’s a bit less margin to the left of the items, and there are no longer disclosure triangles next to the different sections such as SHARED, GENIUS, and so on. You now hover your cursor over them to see a small Show/Hide text that you can click on. You can even hide the source icons (in the General preferences) and have only text in the sidebar. And if you create playlist folders, their contents don’t indent either, though sub-folders do. There’s a new view, called Album List view, available in all libraries, and it is similar to the previous List view (the new List view doesn’t display artwork). The main idea behind this view is to show album art only when you have three or more tracks in the same album, and to use what was previously the Artwork column to display artwork and album names. You can choose from three sizes for artwork: small, which displays when there are at least three tracks, medium, with five tracks or more, or large, which requires seven tracks. (In the Books library, artwork displays in a single size, regardless of how many items make up a book.) You can’t choose to change the size of the artwork by resizing its column, as you could before. You can get rid of the Album column, in this view, saving space, since the album name displays at the right of the album art. This works well, and I find that displaying the album name next to the artwork and not having an additional column with the album name makes the display much lighter, as there is plenty of white space. Add to this some additional space between lines, and the overall impression of the program is one of more space: in iTunes 9, 24 tracks took up 410 pixels vertically; the same number of tracks uses 458 pixels vertically in iTunes 10. Album List view is the biggest visual evolution in iTunes 10. However, I have a lot of albums with fewer than five tracks, and since I’m a visual person, I use album art to spot my music. You can actually override the above artwork settings by choosing View > Always Show Artwork, but you’ll have to do this for each playlist and library. iTunes 9 had checkboxes as part of the Name column for every track. These checkboxes control what you play, or what you sync, if you choose to sync only checked items. Now, you can hide these list checkboxes, which are more subtle than before, from the General preferences. If you never use them, you’ll save a few more pixels. Some of the interface looks as though it was inspired by a company in Redmond, Washington. The Preferences window has shiny icons, and the column headers in List view have a Windows-y look to them. And the sidebar, with its insipid icons, looks, as my colleague Dan Frakes suggested, like it’s a background window all the time. There’s the new AirPlay feature, which, for now, merely means that there’s an icon at the bottom-right of the iTunes window where there was, previously, a speakers menu. iTunes’ preferences has shiny new icons. There are also two new options here: one to remove checkboxes next to tracks, and another to hide icons next to sources in the sidebar. The buttons at the bottom of the window are overlaid on the gray status bar, rather than standing out as gray buttons. The buttons used in the Grid view header are recessed rounded buttons, rather than squarish tab buttons. The Create Ringtone menu item in the Store menu is MIA; there doesn’t seem to be any way to create ringtones any more. The Help Viewer is different for iTunes than for other programs. iTunes’ changes often find their way into Mac OS X, so this may be what the Help Viewer will be in the future for all applications. It’s also worth noting that iTunes is still not a 64-bit application. There’s one feature I couldn’t test: in the Advanced menu, just below Home Sharing, there’s a Choose Photos to Share menu item, that lets you choose to share photos with a “second-generation” Apple TV. More on that when the new Apple TV is released. The marquee feature, Ping, is promising, for those interested in the concept. Some of the space-saving interface changes are useful, but the Windowsization of parts of the iTunes interface, the blandness of the monochromatic icons, and the additional white in some of its views make the program look much more drab than its previous version. 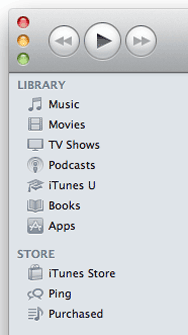 iTunes 10 has a somewhat Soviet utilitarian look which, to my eyes, makes it less interesting to work with. Since it’s one of the programs I use a lot, I’ll miss those splashes of color in the sidebar, and especially the ability to display artwork at the size I want. Oh, and there’s a new icon, as shown at the top of this article. Steve Jobs said they removed the CD because iTunes is no longer about CDs. I kind of like the new icon; it’s a welcome change. But iTunes is about so much more, maybe it’s time they removed the musical notes? Look for our full review with mouse rating coming soon on Macworld.com.